In Friday morning, at 4:50 Kostas “Warlordfff” Koudaras , George “Etern4L” Bratsos, Eustathios “efagra” Agrapidis and Stella “differentreality” Rouzi met in Thessaloniki’s airport. We were about to travel to Nuremberg, Germany to go at the openSUSE Conference at Zentrifuge. After we met up at the airport we checked in and we entered the airplane. It is the first journey of the Greek community to a Conference like that. After two and a half hours we arrived at Zurich airport where we stayed for two hours waiting for the next flight to Nuremberg. The flight between Zurich and Nuremberg lasted half an hour an finally after 4 hour traveling we arrived at Nuremberg. At Nuremberg, we went to the hotel we left our luggage and we went straight to Zentrifuge in order to meet the other geekos and help organizing and in general help at the openSUSE Conference. When we arrived we found people already working there... Bruno who was at Fosscomm was setting up the sound over the halls, other were creating pins with the names of the participants, other were preparing some special bags which include a poster, stickers, a magazine and many other things and other were setting up the presentation laptops. Stella and I helped with the bags, Kostas and Stathis helped with the pins were they excel,and by folding fliers. After that, Jos the community manager decided that we must decorate the halls so George and Stella went with him at IKEA and bought some pretty things for the halls. After a long and difficult day at 19:00 we stopped working and started drinking beers :) We had a small “Pizza Party” !!! Fifteen pizzas arrived at Zentrifuge for the geekos there! Old Toad the openSUSE beer helped geekos retrieve their strength for the next day! We ate, talked about several things laughed a lot and drunk many beers! After the long day, we took the metro and returned to our hotel in order to rest, take a bath and prepare our selves for the next awesome day. 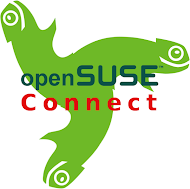 You can find photos from the openSUSE Conference at our Facebook Group and at Kostas Koudaras Picasa. We upload photos all day long !